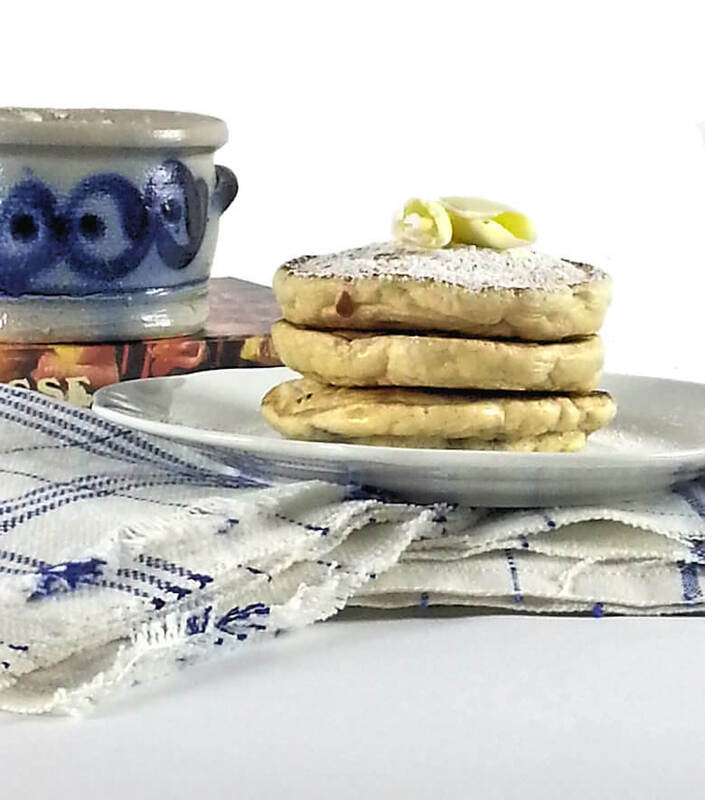 These Small Raisin Dessert Pancakes are made in about 20 minutes. Made from a simple batter of ingredients you will have in your pantry. Serve them immediately after baking, add some powdered sugar and butter and you will enjoy a lovely satisfying dessert. I know pancakes for dessert, that seems like turning your meals upside down or inside out, however enough people talk about breakfast for dinner or dessert as lunch. Funny enough, I am raised with pancakes as a main dinner dish, not as a breakfast. When I met my husband, many many years ago, there was surprise on his face when I told him that our pancakes are as large as a wheel and that we eat them at dinner time. I was surprised to learn that he was used to eating pancakes for breakfast. Of course we are talking different types of pancakes. Will explain all that in a later post. These Small Raisin Dessert Pancakes is also something typical Dutch; we call them actually ‘3 in a skillet’ (this is the literal translation from ‘Drie-in-de-pan’). They are small and 3 fit in a large skillet and three is also the number your serve per person. Now, please don’t ask me, why 3 and not 4, because the only explanation I have ever heard is simply ‘4 didn’t fit in a skillet’. I know its lame, but if you have a better explanation, I am all ears. 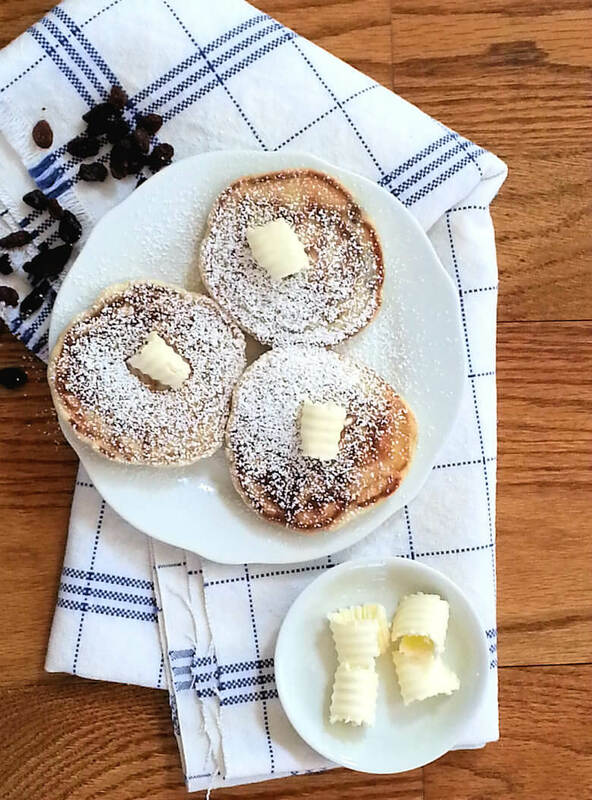 Traditionally my mother never stacked the pancakes, they were always next to each other on a plate, with powdered sugar on top and a little bit of butter. 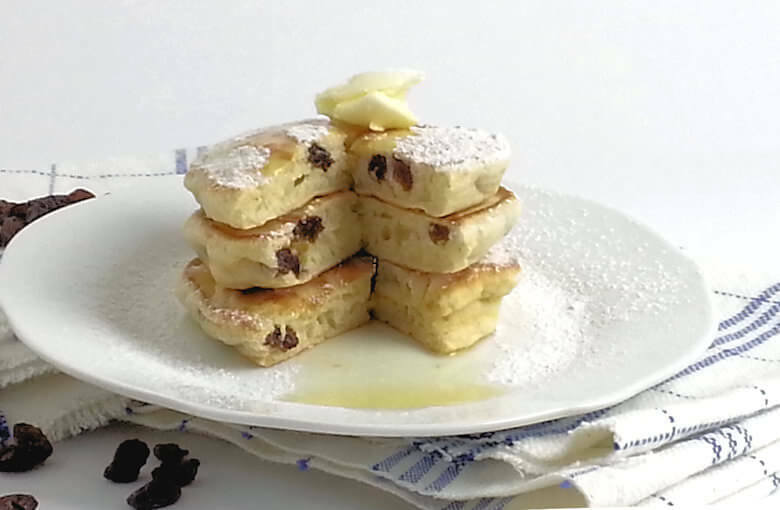 So let’s go ahead and make these Small Raisin Dessert Pancakes; easy-peasy. You mix dry and wet ingredients separately and then combine them, add raisins and scoop the batter in the skillet. Only one note of caution; they bake quickly, so don’t walk away; watch these little ones. I have only used raisins as a filling, but I know that some people use raisins and apple. Add egg and milk to the dry ingredients and mix until smooth. Heat butter in a skillet and pour half of the batter into the pan, divided in 3 pancakes. Once the pancakes are brown on one side, flip them and bake the other side until brown as well. Place 3 raising pancakes on a plate, stacked on next to each other; dust with powdered sugar and a little piece of butter.